Although his second album has been a huge success, selling over 10 million copies so far, Ed is confident that his next few records will be even better. Speaking about the new material he has been working on, Ed said: "I could probably release one of them tomorrow and have people like it. 'X' was full of good songs and a couple of great songs, and I feel like on the next couple of records there will be more great songs than good songs." 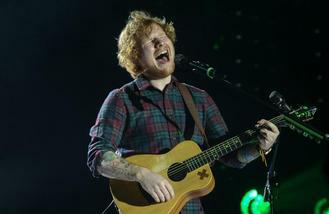 Ed also admitted that he has considered putting a band together but ultimately thinks he is better as a solo artist. Asked if he had thought about it, he said: "Yeah. And then I kind of was like, 'There's no one else at my level doing what I'm doing, so why would I want to do what everyone else is doing?' Surely it's better to be different. And I know my show can be better when I do it solo than if I do it with a band." And the ambitious singer/songwriter has big plans for the future. He told Rolling Stone magazine: "I want to do stadiums everywhere, not just certain places. We just did Dallas and Houston, and Boston is next. I want to be able to do a proper stadium anywhere in the world."